Its a funny world we live in. As academics in the field of employment relations our expertise includes the analysis of the causes, process and outcomes of industrial disputes and particularly the dynamics of strike action. Given the near certainty of further strikes (Follow-up strike will go ahead says union, March 22nd), it is clear to us that the actions of the chief executive of British Airways, notwithstanding his protestations to the contrary, are explicable only by the desire to break the union which represents the cabin crew. What other possible interpretation can there be forWillie Walsh rejecting Unite’s acceptance of BA’s previous offer or indeed of his marshalling of resources, including those of bitter industry rival Ryanair, to undermine the action of his staff? Walsh and now Prime Minister Brown have made the error of underestimating the deep seated and justifiable anger of a loyal and dedicated workforce, whose continued trust and goodwill is a vital ingredient of customer care. Overwhelming majorities in two strike ballots in the face of tabloid opprobrium testify to employees’ understanding that a victory for Walsh’s macho management strategy would precipitate a race to the bottom in terms of working conditions and job quality. In the process, this would damage beyond repair the high standards of customer service for which BA cabin crew are renowned. The wider significance of a triumph of unilateral management prerogative would be a widening of the representation gap in UK employment relations, and a further erosion of worker rights and of that most precious of commodities â€“ democracy. For all these reasons, BA’s cabin crew and their union, Unite, deserve our support rather than knee-jerk vilification. I haven’t included the list of signatures but it’s well worth a look. THE RECESSION VERSUS EVERY OTHER POST WAR US RECESSION. via Economist’s View Again, this is the biggest things since the Great Depression. It still matters. This comes from the Minneapolis Fed. More graphy goodness at the source. Positive effects of campaign spending on electoral outcomes have been found in several comparative, multiparty contexts, but very few of these systems use proportional representation. The few studies examining spending effects in multiparty elections have found that incumbent spending is no less effective than challenger spending, contrary to the vast bulk of empiricalliterature drawn from single-member district contexts. This study reexamines incumbentâ€”challenger differences in spending effects under the single transferable vote. Examining the Irish general elections of 2002, the authors find a positive and statisticallysignificant relationship between spending and votes. Candidates that spend more win more votes, and outspending oneâ€™s rivals means winning more of the vote share. Spending more also directly increases a candidateâ€™s chance of winning a seat. Finally, incumbent spending is considerably less effective thanspending by challengers from other parties but no less effective than spending by challengers from a candidateâ€™s own party. Earlier this week I gave a talk about the state of the crisis at Princetonâ€™s Plasma Physics Lab, and one audience member asked a really good question: if the problem is that interest rates are at the zero lower bound, why should we worry about government borrowing? After all, doesnâ€™t that mean that the government can borrow at a zero rate? Now, part of the answer is that you really donâ€™t want governments financing themselves largely with very short-term debt â€” that makes them too vulnerable to liquidity crises. But even long-term rates are low â€” the real interest rate on 10-year bonds is below 1.5 percent. And if you do the arithmetic of debt service, that really does seem to suggest that debt isnâ€™t a problem. To stabilize the real value of debt, all the government has to do is pay the real interest on it. So suppose that we add debt equal to 100 percent of GDP, which is much more than currently projected; servicing that debt should cost only 1.4 percent of GDP, or 7 percent of federal spending. Why should that be intolerable? And even that, you could argue, is too pessimistic. To stabilize the debt/GDP ratio, all you need is to pay r-g, where r is the real interest rate and g the economyâ€™s real growth rate; and right now r-g looks, ahem, negative. 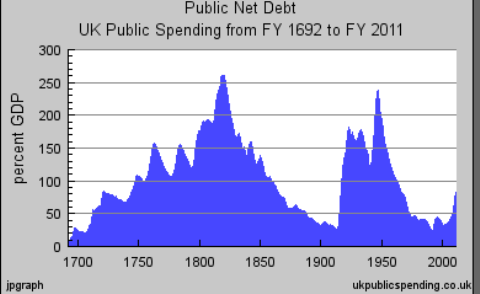 And this benign view of debt isnâ€™t just hypothetical: countries have, in reality, run up immense debt/GDP ratios without going insolvent: see the history of Britain, above. So whatâ€™s the problem? Confidence. If bond investors start to lose confidence in a countryâ€™s eventual willingness to run even the small primary surpluses needed to service a large debt, theyâ€™ll demand higher rates, which requires much larger primary surpluses, and you can go into a death spiral. So what determines confidence? The actual level of debt has some influence â€” but itâ€™s not as if thereâ€™s a red line, where you cross 90 or 100 percent of GDP and kablooie; see the chart above. Instead, it has a lot to do with the perceived responsibility of the political elite. What this means is that if youâ€™re worried about the US fiscal position, you should not be focused on this yearâ€™s deficit, let alone the 0.07% of GDP in unemployment benefits Bunning tried to stop. You should, instead, worry about when investors will lose confidence in a country where one party insists both that raising taxes is anathema and that trying to rein in Medicare spending means creating death panels. Much has already been written about what went wrong.Â Much more is yet to be written. In a series of papers and now a book, they have demonstrated in exhaustive historical and statistical detail that while it always seems in the heat of the crisis that ‘this time is different’, the truth is that it almost never is. As Rogoff and Reinhart demonstrate convincingly, all financial crises ultimately have their origins in one thing – rapid and unsustainable increases in debt. As is clear, Krugman is refering to the now bandied around figure that once debt goes over 90% trouble arises. But as is even clearer from the graph above, this simply doesn’t apply when there is confidence that this debt will get paid off. So where does this figure come from. Essentially it has arisen from the very impressive work of Reinhart and Rogoff. I read Reinhart and Rogoff’s book and that 90% figure didn’t jump out that strongly, nor did the book seem to give strong support for the Conservative/Fianna Fail commitment to cuts regardless of consequence. So I was a bit surprised when I say Ken Rogoff name onthat letter to the Sunday Times, which ostensibly supported Osborne’s proposals. Given these risks of higher government debt, how quickly should governments exit from fiscal stimulus? This is not an easy task, especially given weak employment, which is again quite characteristic of the post-second world war financial crises suffered by the Nordic countries, Japan, Spain and many emerging markets. Given the likelihood of continued weak consumption growth in the US and Europe, rapid withdrawal of stimulus could easily tilt the economy back into recession. The exact timing of measures should be sensitive to developments in the economy, particularly the fragility of the recovery. THE NUMBER of vacant houses or apartments in the State stands at 345,000, or 17 per cent of all housing, according to new report published today by the Urban Environment Project at University College Dublin. Came across this via The Cedar Lounge, this situation with Greece is getting more and more ridiculous. Now, some German government politicians are calling on Greece to sell off some of it’s Islands to finance its debt. Greece should consider selling some of its uninhabited islands to cut its debt, according to political allies of German Chancellor Angela Merkel. Full story on the beeb.